A sneak peek at the new art show! I’m just going to share a couple “teaser” images with you today, down the line I’ll share each of the new pieces up close & personal. I couldn’t be more delighted with how this show looks! Our artwork blended effortlessly and seems like they were made to show together. It’s a fun mix with her abstract canvas work and my dimensional art! There are a lot of other art surprises included but this gives you a good feel for the show. 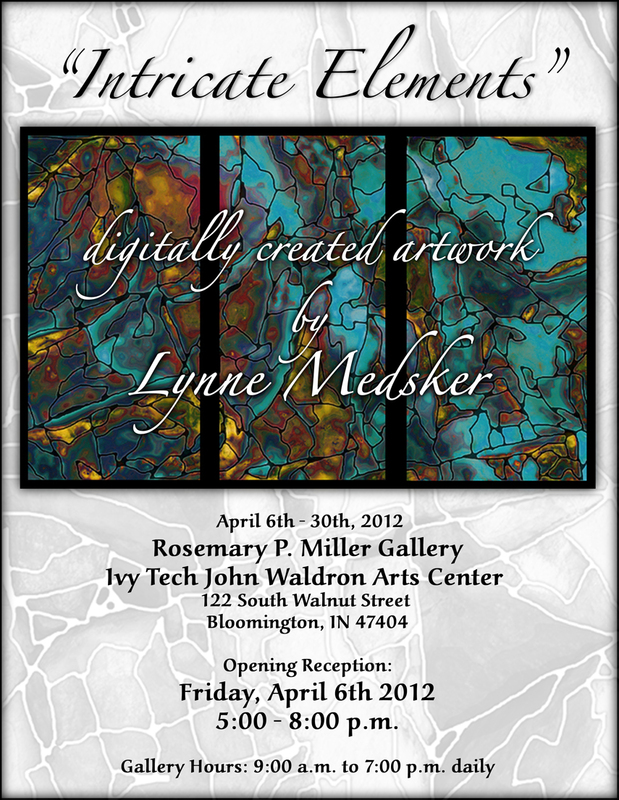 Don’t forget that tonight is the private opening and tomorrow is the public opening/gallery walk from 5-9. One of the cool things that is happening with the “intricate Elements” show? My images were included in this project! Because you are our April artists, your art will be featured in this year’s “Art Into Poetry” project. The project is a partnership between Ivy Tech students enrolled in Introduction to Poetry classes, and the members of the Ellettsville and Crestmont Boys and Girls Clubs. Each year, students teach members of the Boys and Girls Clubs how to respond to visual art from the Waldron galleries through poetry. The best poems written for each piece of art used will be displayed in the gallery underneath that piece of art. When: Friday, April 13, 2012, 5:00-6:00 p.m.
Why: To honor all those who participated in Art into Poetry 2012 and for FUN! If I can get permission I’ll post some of the poems with the images here soon!